The ServerLIFT SL-350X and SL-500X models and the older ServerLIFT SL-500 have a lifting mechanism where the support arm is vertically extended either manually or by battery (similar to a forklift) to lift the load to the required height in a rack. 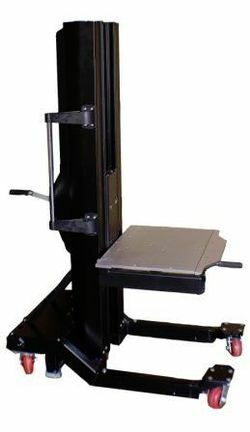 To ensure that the load can also be lifted in data centre environments with very low or suspended ceilings or low-hanging supply lines by the server lifters up to the very tops of the racks so that the vertically extended support arm does not hit the ceiling, an extension module for the ServerLIFT loading platform is available called the RL-500 Platform RISER. The module can be quickly and easily attached with butterfly screws to the ServerLIFT lifting platform. This increases the loading surface for the IT equipment by a good 40 cm. The riser can handle total weight of up to 227 kg and reaches the very top levels of the racks. The ServerLIFT Platform Riser is also ideally suited for use in very low, contained warm and cold aisles and for uneven ceiling surfaces.